DataCal large print keyboard labels can be configured to a Dvorak keyboard layout for the standard, left-handed, or right-handed keyboard layouts. Instructions for the Dvorak layout are included. These labels are opaque and completely cover the keys. The Large Print English Dvorak language keyboard labels are available in black letters on beige labels (for light colored keyboards) or white letters on black labels (for black keyboards and laptops). The label set includes the labels necessary to create the US keyboard layout according to the Microsoft code page including the function keys, the numeric keypad, and all control keys. 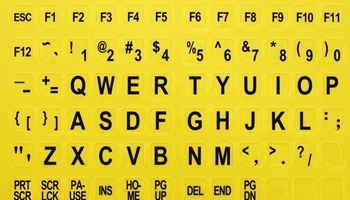 These labels are opaque; they will cover the original printing on the keyboard key completely. You must first configure Windows for the Dvorak keyboard layout that you wish to use. The process is similar to setting up an international language; the operations and steps are exactly the same. The only difference is that you select English (United States) for the language and Dvorak keyboard layout (standard, left-handed, or right-handed) as the keyboard. After you configure Windows, you will be able to manually select the Dvorak keyboard when you wish to use it. For additional information on keyboard setup, see the Windows Help file system of contact Microsoft technical support.